Vibrant Hair depends on a balanced diet. It can take longer to notice changes in your hair than in your skin. Hair has two distinct structures – first, the follicle itself, which resides in the skin, and second, the shaft, which is what, is visible above the scalp. A balanced protein rich diet can help boost hair growth. 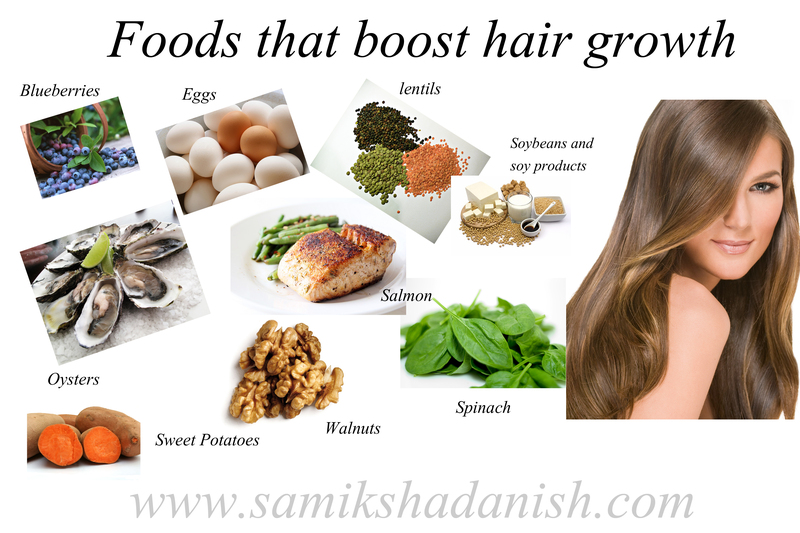 Here are some Foods that help hair grown healthy. 1. Salmon – Rich in Vitamin D and omega 3 fatty acids, that are both essential for hair growth. Omega-3s are also found in cell membranes in the skin of your scalp, and in the natural oils that keep your scalp and hair hydrated. 3. Oysters – Oysters are rich in zinc, a lack of which can lead to hair loss (even in your eyelashes), as well as a dry, flaky scalp. 4. Eggs– A great source of protein, eggs are loaded with four key minerals: zinc, selenium, sulfur, and iron. Iron is especially important, because it helps cells carry oxygen to the hair follicles, and too little iron (anemia) is a major cause of hair loss, particularly in women. 5. Sweet Potatoes– Rich in beta-carotene or Vitamin A. Vitamin A is an antioxidant that promotes healthy scalp and encourages hair growth. 6. Spinach– Spinach is an important vegetable for hair growth because it is high in protein and vitamin A and vitamin C, which the body uses to produce oils in the scalp, which can help increase hair growth. Vitamin A and vitamin C deficiencies can increase hair loss or lead to brittle, thin hair that does not grow as quickly. 7. Blueberries– Rich in Vitamin C, It has being proved that vitamin C plays an important role faster hair growth. This vitamin for fast hair growth is an antioxidant that strengthens hair shaft and hair follicles and prevents hair breakage. 8. Soybeans and Soy Products – Soybeans and soy products are high in omega-3 fatty acids, which are more difficult to come by if you are on a vegetarian diet that does not allow fish like salmon and halibut… Omega 3 can help to grow hair by increasing hair follicle growth from the inside out while making hair fuller and thicker. Tofu, soy milk, steamed soy beans and soy supplements are sources of omega-3 fatty acids. 9. Lentils– Lentils are high in protein content and derive a significant amount of their caloric content from protein. Hair is made up of protein, so it is important to eat protein-rich foods like lentils or even beans for hair health, particularly if you are on a vegetarian or vegan diet that does not allow animal products like eggs, fish or lean meats for essential protein.